3:15 pm—2 T butter: put in Solar Hot Pot, cover, set up facing the sun, set timer for 15 minutes. You could also do onions, peppers, garlic, or other veggies to go with the burgers. 3:30 pm—veggies: place in bottom of Hot Pot. Then put baking rack with burgers in top of Hot Pot. Cover, set up facing the sun, set timer for 1 hour. 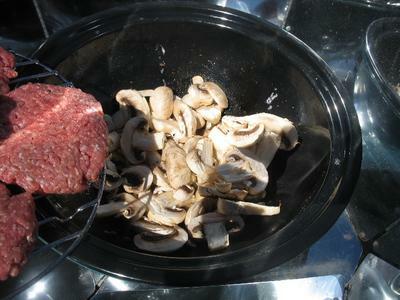 4:30 pm—(check burgers), adjust to sun, set timer for 30 to 60 minutes, depending on how done your burgers are looking. 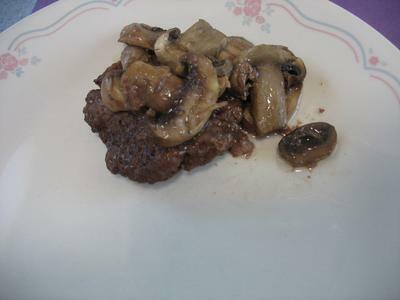 5:00 pm—check burgers and mushrooms; stir carrots. If burgers are not done, be aware of food safety. Are you tired of me talking about food safety yet? LOL Don’t leave food for more than 2 hours under 150 degrees Fahrenheit. Seems like the only time we’ve had trouble with this, though, is with clouds. However, we are at a higher altitude (3500 ft.), so that gives us an advantage. Then again, we are above the 40th parallel, so that’s a disadvantage. But most of the time, we’ve been well above 150 degrees within 2 hour marks. It’s been so fun to see it work! After burgers are done, add cheese and put cover back on to melt cheese, if desired. I can’t have store-bought hamburger buns (chemicals) and was too tired to make my own. But I don’t miss the bun with these mushrooms smothering the burger!!! !